Last February 17, Novaliches Academy (NA), presently known as Metro Manila College (MMC) Batch 1968 celebrated their Golden Anniversary. 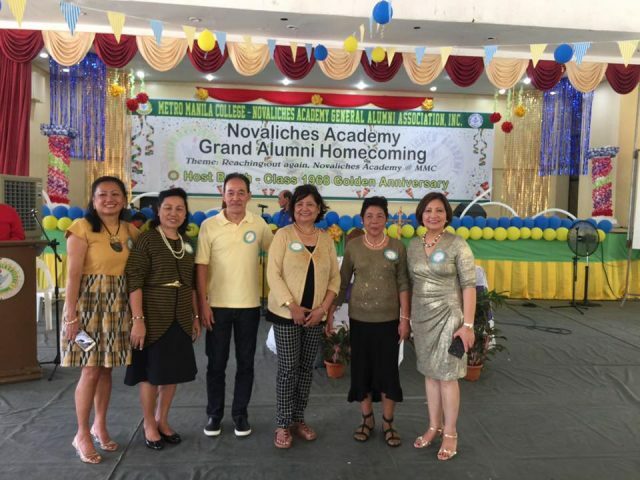 The Grand Alumni Homecoming with the theme “Reaching out again, Novaliches Academy @MMC” was held at the MMC covered court. Batch ’68 Prime Movers – People who initiated and made possible the Grand Alumni Homecoming [on the extreme right photo is Lyzbeth Miranda-Arellano, one of GMEFI incorporators; below photo shows GMEFI president Evelyne Dominguez [standing behind Ms. Lyzbeth Arellano] with NA Batch ’68 graduates. Part of their program was the introduction of Gawad Metronian Educational Foundation (GMEFI), the social responsibility arm of MMC established in 2014. Its President Dr. Evelyne M. Dominguez introduced GMEFI via an Audio Visual Presentation (AVP) directed by one of GMEFI’s Board Member, Mirana Medina. The film presents the history of GMEFI, its programs and activities. It also touches on the background history of NA’s establishment. A follow-up message from Board Member, Mrs. Natividad Villano on how they can be of help to the Foundation and the importance of giving back to their Alma mater was stressed. It was timely that before the event, parents of scholars were sponsored to attend a free training on detergents and soap making. The finished products are exclusively distributed by GMEFI at a minimal cost. This gave GMEFI an opportunity to have a booth where the products were displayed and offered during the event. The Scholars offered the said products to the participants. It had been a good venue for the public to know more about GMEFI’s programs and activities and especially to meet its staff and scholars. GMEFI Scholars also participated and performed a dance number for the enthusiastic alumni attendees. The event served as GMEFI’s way of letting the participants know that their Alma Mater has an organization officially recognized by government agencies; one that fully supports many poor but deserving students — including Persons with Disability. We have high hopes that NA and MMC alumni could help support GMEFI scholars as a way of “giving back” to the school that once nurtured them to become who they are.